Nancy has been in collaboration with BLT Research colleagues Levengood and Burke since 1993. BLTs breakthrough investigations established protocols in field and plant studies respected worldwide, and recounted in several documentaries. In 1999, an opportunity to carry out some new research presented itself when New York philanthropist Laurance S. Rockefeller offered funding. In order to meet Mr. Rockefeller's requirements Ms. Talbott sought and was granted non-profit, tax-exempt status, and BLT Research Team, Inc. was created, with Ms. Talbott as President. it was very cold and dark outside but a clear starry night nevertheless - even tho the cold temperature makes stars and planets appear smaller than with warm weather, the object in the sky was quite huge and clear, at least twice the size of planet Jupiter. Both Jupiter and Venus is located at different dec. and the object disappeared from location after 1 1/2 hour. The telescopic filters shows that the object pushes red light (high energy), and blocks blue, the object also appears to be of a Dropa shape - it is at least similar. We were 5 witnesses present when the object appeared. So here again guys this shows you how elected officials and party heads of countries aren't able to disclose information, even when they are in the know of whats going on - so what chance do the public have of ever finding out themselves! This clip is about a women and her daughter that was in hospital and was on last hours of life until something showed up and changed things. Below video has a photo of what was seen taken by hospital camera. Nick Pope, the former Ministry of Defense officer for the United Kingdom, was officially responsible for researching and investigating UFO's, crop circles, and other strange phenomena. Now hes come to L.A. to reveal UFO evidence! Between 1991 and 1994 he was posted at a division called Secretariat. While there, Pope claims Strong evidence emerged suggesting the presence of structured craft capable of speeds and maneuvers beyond the capability of even the most advanced prototype craft operated by the Royal Air Force or the United States Air Force. Any comments on this guys - would like to know if you think this is genuine or not ?The object seen by the STS 115 ATLANTIS SHUTTLE CREW may have been this DISK OBJECT videotaped in Space near the ATLANTIS SHUTTLE. It is moving away and it looks like its within the 100 feet range or a little further. As the title says guys... could it be a weather ballon? Rep. Kissner had assembled many old newspaper articles and leaked government information from unofficial military and intelligence testimonies. He asserted there was an American government policy to shoot down unidentified discs in the late 1940s to early 1950s until retaliation by the discs, which included the deaths of many pilots, forced a cancellation of our aggression. According to Howe, Rep. Kissner contends that the Truman Administration ordered a policy of denial in the interest of national security about all UFO crash retrievals, a policy that remains in force to this day. Howe will present information about the possible nature of the disc retaliation and other disturbing phenomena linked to the non-human intelligence controlling the discs. Always a contraversial subject - alien abductions - whats your thoughts on this topic guys? Would like to wish you all an amazing Christmas and a Happy new year as we approach 2009!. Thanks to all the loyal followers of the blog - your comments and suggestions have are all appreciated!. 2008 was a huge year for ufo sighthings, so keep coming back cause i feel 2009 is only going to be bigger. As always i will keep you updated on only the best real ufo sightings through this holiday season - keep your cameras rolling and as always keep your eyes to the skies! P.S our forum is Now back online. Happy holidays guys! UFO fossils discovered in China ? This is a strange object filmed over buenos Aires on the 31st of March 2008 , looks like a plane but then it hovers for a while - whats your comments on this guys? I just came back from buenos Aires myself guys so i know there is a major airport there but who knows ..
"It's hard to draw a surfer's attention away from the next wave, but whatever was in the southwest sky Friday evening around 6:20 p.m. drew a crowd along Kewalo Basin and Ala Moana Beach Park. Honolulu resident Peter Hollingworth described it as two lights circling in the sky, about 45 degrees above the horizon. Video of one of the lights was recorded from the KHON 2 SkyCam. These two little fireballs with a stream behind it, said Hollingworth. Looked kind of like a shooting start but it just kept going. They changed directions a few times, at first it was coming in then it turned, then it went out then it came back in again" Hollingworth was surfing with his 12 year old son when the unexpected show began. Santiago 10 december - Ufos or planes? Very strange sets of lights seen over the skies of Santiago yesterday guys - some look like a set of planes in formation while other lights look different - any comments guys? Des OVNI a Santiago Le 10/12/08 !! Here goes Jamie again - what do you think? Jamie Maussan is well respected in south america for his ufo knowledge. This recent footage he came across shows what seems to be an alien - is jamie being conned with this footage or is it the real thing guys? My Space censors Gary McKinnon song because it was too popular ! As you may know there is currently enormous pressure on the Uk government by the Bush admistration to extradite Gary McKinnon (famous NASA Ufo Hacker) to the USA. With Gary's gaining popularity - The campaign to 'get' Gary is going at all lengths to discredit his name. Recently Myspace (controlled by media magnet Rupert Murdoch) jumped on to the censorship bandwagon when they realised his song 'Only a Fool' made it to No 5 on their song charts..
MySpace in America appears to have blocked a search on Gary McKinnons own song and video on My Space. They Deleted his last song and video on My Space after it got 360,000 hits within 48 hours and reached the top five in the Music Charts all within 48 hours. Succumbing to the pressure of complaints Mypsace seems to have now allowed a new upload of the song to remain (but the original was never restored) and as you can clearly see below it does not have as many hits as the original upload - so what does this all mean guys ? 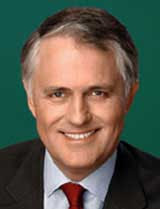 - is this evidence of the media being manipulated by government pressure? 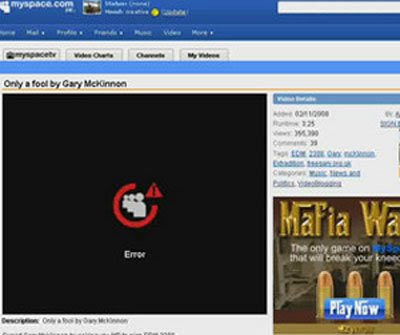 Was Mr Murdoch not happy with Gary being promoted on Myspace? Just aired the other day guys - New evidence suggests there was more than one UFO crash near Roswell. On July 8, 1947 at 5:26 EDT, an Associated Press news wire announced that soldiers from Roswell Army Air Field in New Mexico recovered a "flying disk" from a nearby rancher's property. The tiny town of Roswell has never been the same. Now, 61 years later, new theories, new witnesses, and new evidence have emerged. The most shocking lead is that there may have been a second crash, and if it can be found, it may finally reveal what really happened at Roswell. Two UFO's over Johannesburg, South Africa on November 22, 2008. If you live in London or the Uk this is your final reminder to come to the important protest this Friday to save Gary McKinnon - the guy famous for hacking into NASA. There much debate about Gary - Some don't believe Gary hacked into computers just for ufos and is using the Ufo explanation as an excuse (any comments on this guys?). With the popularity of realufos.net increasing we have also attracted alot of unwanted attention online recently. Due to ongoing problems with spammers & haters the realufos.net forum will be temporarily Closed. I need to sort out with our current moderators the situation to ensure to forum remains a friendly place for people to discuss the Ufo topic. I am asking our moderators to please email me to discuss the situation. There are many famous reports of Aliens being buried in the early 1900's int he USA. Strange footage of the possible TR-3B / Aurora Plane over STIRLING? As you know guys a few months ago the US military confirmed they have a triangular shapped hypersonic plane using the 'explosive type' engine. Although this video filmed over Stirling in 2001 is sketchy could this be actual footage of it? UFO ou TR-3B au dessus de Stirling? CLOSE encounters of the first kind seem to be occurring regularly at weekends in a remote area near Dewsbury. Bright lights hover in the sky, sometimes in a triangular formation, and then apparently fly off at great speed. Guys this was a new CNN special report - Does alien abduction really happen, or is it the product of vivid imaginations? CNN's Miles O'Brien reports? While running for president in 1976 Jimmy Carter mentioned his 1969 UFO sighting which he reported to the International UFO Bureau in 1973. Later in the campaign he stated he would, "make every piece of information this country has about UFO sightings available to the public and scientists." After he was elected approximately 10,000 letters arrived at the White House calling on the new President to follow through on that promise. This created quite a stir and prompted the Carter White House to sign off on two extraterrestrial studies - both of which were resisted and quietly shut down by the Department of Defense and other agencies. The Cold War would not be over for another 14 years. It was too soon. 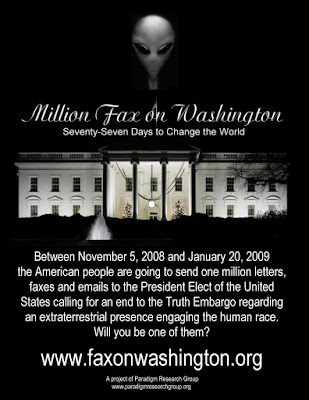 If 10,000 letters in 1977 launched two ET studies, what might 1 million letters, faxes and emails in November of 2008 accomplish? What creates weird clouds like this? Never seen clouds like this before guys? On Friday 16th September, at approximately 10:15, 62 children from Ariel School, a private primary school in Ruwa (about 20 km from Harare) were in their playing field for the mid-morning break. Suddenly, they saw three silver balls in the sky over the school. These disappeared with a flash of light and then reappeared elsewhere. There is a line of electricity pylons and according to one boy, the object followed along this line prior to landing. There is also some controversy as to whether the object _landed_ on the ground or hovered above it. Strange what is this helicopter doing? UFO over Valparaiso Chile ? What coudl this be guys, it may be the lights froma commercial plane but not sure myself .. any comments? A Secret Base for UFO Flight Simulators ? Bit out there guys ... apparently this is an interview with an aeronautical engineer who claims to have worked at a secret base for UFO flight simulators. While shooting Friday Night Football highlights over Sacramento, Air10 pilot Ed Georges and FNF correspondent Angel Cardenas spotted a strange set of lights flying over their helicopter.Not long after their sighting, several callers phoned the News10 newsroom to report seeing the same phenomenon. Very interesting footage - Amazing moving Ufo lights seen on November 15, 2008 Ladner, British Columbia, Canada. Any comments guys? Vidoe of the Edmonton Meteor, the first video is amazing.. in the second video what was that small thing next to it? ufo knocks plane out of the sky? The accused hacker has been refused a written judicial review of the Home Secretary's decision not to suspend extradition proceedings in light of his recent diagnosis with Asperger's Syndrome. McKinnon's lawyer, Karen Todner, has been given until 5 December to apply for an oral judicial review (ie a hearing in chambers). The legal setback follows decisions by the House of Lords to deny his appeal against extradition and the European Court of Justice washing its hands of the case. Numerous people living in Edmonton and surrounding areas are reporting seeing a meteorite-like fireball that lit up the sky. It not been confirmed as a meteor by official sources, but many witnesses report seeing "bright orange flames" with a large tail that shot horizontally across the sky and then disappeared. Others said it looked like horizontal lighting, where all the clouds in one huge swath were lit up. Richard Bellington said he was driving north of Highway 2 on his way to Edmonton when he saw the sky light up. The flames were so bright and appeared to travel so close to the ground that he called 911. Callers as far as Onoway, Beaumont and Cold Lake also report seeing the ball of flames. Stations as far north as Fort McMurray also report seeing the fireball. Some experts say the fireball could be part of the Leonids meteor showers, where activity has been predicted to begin on Nov. 17. Upon the heels of multiple sightings in the area on October 23, last Tuesday, November 18, proved just as noteworthy for local residents. Michael Corn, 27, and former member of the United States Army assigned to a Patriot Missile Unit from 2003 to 2006, saw something for which he has no explanation. Corn said while at home at the intersection of Hwy 377 Business and U.S. Hwy 281, friends called him outside at approximately 7:15 p.m.
As he looked toward the small town of Dublin in the southwest sky he saw what appeared to be a brightly lit hovering object. “It looked really close to Stephenville like it was almost over the courthouse,” Corn said. December 30, 1978, a television crew from Australia recorded background film for a network show on interviews about the sightings. For many minutes at a time on the flight to Christchurch, unidentified lights were observed by five people on the flight deck, were tracked by Wellington Air Traffic Controllers, and filmed in color by the television crew. One object reportedly followed the aircraft almost until landing. The cargo plane then took off again with the television crew still on board, heading for Blenheim. When the aircraft reached about 2000 feet, it encountered a gigantic lighted orb, which fell into station off the wing tip and tracked along with the cargo aircraft for almost quarter of an hour, while being filmed, watched, tracked on the aircraft radar and described on a tape recording made by the TV film crew. ABC News-The Lake Champlaign Monster caught on tape? 50 foot long Skylab was once Probed by an 800 foot long UFO. The NASA crew took four color pictures of the glowing red alien spacecraft as seen here. A documentary on the events that occured in the sleepy and lonely town of Kecksburg,Pennsylvania on the date of Decmber 9th, 1965. According to many residents of the town they saw an acorn shaped object crash land in a wooded area which they clkaimed had hieroglyphic carvings on it's mettalic body. Is this a star of a ugo guys? These debris seen during the recent nasa sts126 endeavour docking look very strange , any opinions guys? What you guys think of these Orbs things guys? Some people they look like birds but on closesup they aren't? An oldie - Multiple UFO's over Tremonton, Utah on July 2, 1952. Weather ballon or Ufo in Scotland ? Could this woman really have somethign recovered from a ufo? do you think she is telling the truth guys? Governments all over the world are working hard to learn how to manipulate weather before global warming impacts on food production by using barium and heavy metals in chemtrails. If you see many criss crosses from planes in the sky like the below ones you may notice that eventually a cloud forms - however what they don't tell you i that barium eventually falls to the ground and can make you sick - this may be the reason why ufos are seen always near chemtrails - are they trying to neutralize them - who knows? Captain Terauchi, a veteran of 29 years flying, said "It was a very big one or two times bigger than an aircraft carrier." He changed altitude and made turns, with FAA permission, in an effort to identify the objects which continued to follow him. He said the objects moved quickly and stopped suddenly. At one time, the light from the large object was so bright that it lit the airplane's cockpit and Captain Terauchi said he could feel heat from it on his face. He added that he had been watching the UFO for six minutes before notifying anyone on the ground; this would make the start of the sighting about 6:13 p.m.
Now that Obama is the new elected president to be what do you think his stance will be on Ufo disclosure? Great ufo footage from 8th November 2008 as shown by Mufon - any comments guys? Was it a Ufo over Piura in Peru Nov. 1, 2008 ? Was it a ufo over quebec Canada, December 30 ?